Imphal, Dec 9: Team of Central Adoption Resource Authority (CARA), a statutory body of Ministry of Women & Child Development, Government of India today called on Social Welfare & Cooperation Minister Nemcha Kipgen at her Office Chamber at New Secretariat, Imphal to discuss on how to effectively promote legal adoption in Manipur. The visiting team of CARA include M. Ramchandra Reddy, Chairman, CARA, Dr. Gundlapally Sreenu, OSD to Chairman, R.K. Pramodini, Member, Adoption Committee, CARA, Annie Mangsatabam, Member, Adoption Committee, CARA amongst others were part of the meeting. Appreciating the visiting team for highlighting various concerns and issues to look into regarding child adoption in Manipur, Minister said that as a concerned Minister as well as the lone woman Minister in the cabinet, she deeply felt connected when it comes for the welfare of the children and the downtrodden.She said, children should be give care of, to the right hands. She assured that whatever can be done from her end as well as from the Government of Manipur, will surely be executed without much delay. She also urged the team to initiate for the opening of the concern offices in the seven (7) newly created districts so that children from every nook and corner will not be deprived of their basic rights. Minister further assured that all the concern stakeholders like District Child Protection Unit (DCPU), Child Welfare Committee (CWC)will soon be placed at the same office venue. Nemcha felt extremely privilege to interact with the team and laud Maneka Gandhi, Union Cabinet Minister for Women & Child Development for initiating such purposive and progressive meeting for the welfare of the children of our state. It may be mentioned that CARA is designated as the Central Authority to deal with inter-country adoptions in accordance with the provisions of the Hague Convention on Inter-country Adoption, 1993, ratified by Government of India in 2003. It primarily deals with adoption of orphan, abandoned and surrendered children through its associated or recognised adoption agencies. Crimes against humanity deserve the worst form of punishment. Different nations have different legal system to protect the interests of their country. The enforcement of certain laws – like capital punishment; Special powers act to armed forces may have strong and supportive argument as it is about the security of their respective nations. Gross violation of human rights at certain parts of the country and other parts of the world may receive severe criticisms from many who are concerned for Human values. Arguments may continue for certain human causes permitting each sides to stand tight with their act. But what about some issues like global warming, water scarcity and deforestation? There is no wrong in saying that environment has no boundary. A massive destruction of forest or extraction of crude oil or mismanagement of natural water is among the issues which no nations could give reasonable arguments as it affect regions beyond politically drawn boundaries. After all, these issues are about human beings across the globe. Reports about the scarcity of usable water have been top news at almost all newspaper in Manipur. As for the state of Manipur there is adequate rainfall every year but faced acute shortage of water almost every year in the last couple of decades. Interestingly, during rainy season the state also witnessed flood almost every time. In short the state suffers the ugly face of flood during rainy season while they had to bear drought in the remaining days. In view of the arising situation that we are facing right now, there is an urgent matter that needs to be pondered on what went wrong? Is it the people or is it the government who is responsible for the present crisis? Deforestation that has been taking place illegally at different parts of the state has been often blamed – both by government and the many social activists which is universally accepted by all. 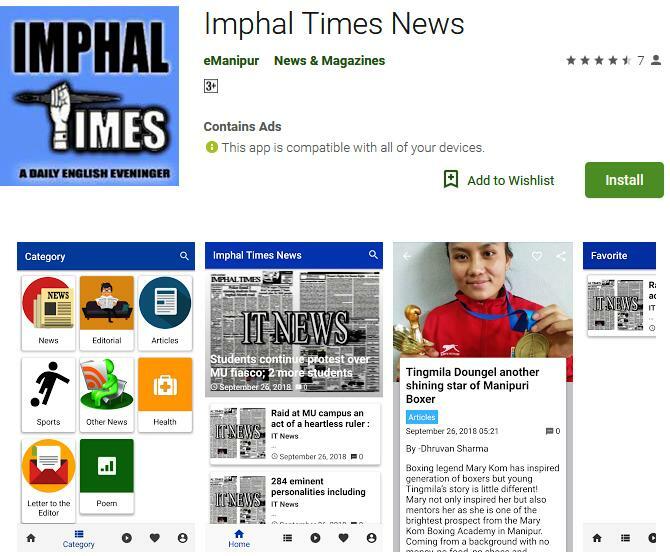 One thing we at Imphal Times suggest is that we cannot completely blame the people who are responsible for cutting the trees for their livelihood. It is the government which is responsible and why shouldn’t it be? It was all about their survival and mind it some people do not have any alternative for survival. On paper government had passed many schemes to substitute the livelihood but it is an open secret that none of this schemes meant for the poor people had never been benefitted by the targeted beneficiaries as the money meant for them had been pocketed by government authorities who were assigned for implementation of the projects. Another matter, which we at IMPHAL TIMES is concerned is the poor understanding of the government department about the need for storage of natural water underneath the earth. There seems to be complete lack of knowledge by the government authority about the need to let the earth absorb any source of water. Clear example is the drain constructed under huge funding from the Jawaharlal Nehru Urban Renewal Mission (JNURM). The cubicle shaped drainage construction has no mechanism to let the drain water absorb underneath the earth. This is not only the case with any government infrastructural development work there is no sign of the government authority showing concern about the importance of harvesting the rain water. Harvesting rain water does not mean that it should be stored in a tank or some man-made water storage tank. It is about harvesting inside the earth core which can be reused using other means. Imphal, Dec 3: Chief Minister N. Biren Singh said that we need to unearth the inner potential and talents in the field of sports of the State and explore it to the world. This was stated by him at the closing function of the 11th Jadonang Memorial Football Tournament 2017 held at THAU Sports Complex, Thangmeiband, Imphal West. Speaking as Chief Guest of the function, Chief Minister said that sports helps in building real human relations and there is no religion, caste, creed etc in sports. Sports have a great value in promoting peace in the world, he added. Chief Minister said that the government is trying its level best to complete the ongoing construction of various sports complex in the hill districts of the State. According to the recent initiative taken up by the Government of India, playing fields and playgrounds would be developed in each and every village to encourage sports in the country, he added. Stating that football is becoming popular these days, Chief Minister urged the Organising Committee of the tournament to organise the tournament at large scale such as National level so that the tournament would have maximum exposure in the country. Mentioning the demand made by the Zeliangrong Union for the construction of Sports Complex, Chief Minister suggested the Union to look for a suitable site for the construction of the complex and Government would extend every possible help for the construction of sports complex. On the occasion, Chief Minister said that the Government would have a concrete discussion with the locals of the Thangmeiband area for the development of THAU ground such as construction of Roofing, Pavilion and Astroturf etc. Chief Minister stated that the Kabuis inhabited in the valley areas of the State were very active in terms of sports including football etc. Earlier, large number of players belonging to Zeliangrong community represented in various clubs during different tournaments of the State. However such representation has been decreasing since many years, he added. Chief Minister said that the reason behind the decreasing number of players from the community might be the non-availability of playgrounds and fields in the locality. On the occasion, Chief Minister extended monetary assistance of Rs. 50,000 to the Organising Committee of the tournament. Addressing the Presidential address of the function, MLA Gaikhangam appealed the organising Committee to think of expanding the tournament at the National level scale and it should not be confined only to Zeliangrong community of the State. He further said that it is indeed true that Haiphou Jadonang was born in Zeliangrong Community but he represents as a symbol of patriotism of human kind. Former Chief Minister Radhabinod Koijam, MLA Tamenglong AC Samuel Jendai, Former Minister Dr. Kh. Loken Singh, Former MLA Janghemlung Panmei, Vice President of BJP Shri Jyotin Waikhom, President Zeliangrong Football Association Gaipuijai Golmei, President Zeliangrong Union Amu Kamei attended the function. The final match of the tournament was played between Langthabal Chingthak Rongmei Club (LCRC) and Keishamthong Kabui Football Club (KKFC). The tournament is being organised by Zeliangrong Football Association. Imphal, Dec. 9: Education, Labour and Employment Minister Thokchom Radheshyam Singh said that an addressal on how to improve the relationship between the doctors and patients is highly required for a better progressive functioning of the health sector. He said that every doctor hopes to fulfil the needs and requirements of the patients but at time things go out of hand. An act of kindness is a necessity to convince and console someone who is in need of care. No matter how advance and dependent health sector may be in medicine and equipment, he said, a positive relationship between the doctors and patients is of utmost importance. The patients’ party, he said, always feel and believe that the sickness and worries will be cured once they reach doctor. They have high expectations and concerns from doctors. The conference, he said is an opportunity to introspect and analyse the best practices and obstacles overcome so far to reflect it for better implementation of the future. The Minister was speaking at the inauguration of the 33rd All Manipur Medical Conference (AMAMECON 2017), organised by the Indian Medical Association Manipur State Branch (IMA MSB) at IMA Hall, Lamphelpat under the theme ‘Depression – Lets Talk’. Further he added that it was delightful to find Manipur placed in third position in the ranking of Best Health Sector in a November edition of the India Today Magazine. The credit for such attainment goes to the doctors and all those involve in the medical service, he said congratulating them on the achievement. Describing the tremendous contribution of IMA, Chairman, MANIDCO & MANITRON, Dr. Radheshyam Y. said health is much more important than wealth and without good health there can be no progress, development and prosperity. Depression, he said is a mental health is a major problem affecting the mood and function of an individual hampering the work progress, productivity and harmony of the family and the society. The conference will help in addressing the problem ‘by looking ways and means of a cure’. Imphal, Dec 9: A book entitled “Chingtam Nongsha” written by Leishangthem Lamyanba Meitei was published today at the Head Quarter office of Democratic Students’ Alliance of Manipur (DESAM), Sagolband Moirang Leirak. The book released depicts the democratic struggle and movement for a peaceful state. The writer, Leishangthem Lamyanba Meitei, was born and bought up at Paona Keithel, second son of L Mangisana and Indira with two sister, one elder and one younger, completed his 12 from Millennium Institute of Science in 2011, B.Sc in Mathematics in 2014 from Imphal College and completed his LL.B in the year 2017 from LMS Law College. Currently Leishangthem Lamyanba Meitei is pursuing M.A in Mass Communication at Manipur University. Moirangthem Angamba Meitei, President; Nameirakpam Edison Singh, Secretary General; Aheibam Anand Meitei, Vice President; Elangbam Mushuk Meitei, Secretary Organisation and Co-ordination; Samurailatpam Devdutta shrama, Secretary Health and environment; Rabi khudongbam, North East Students Affairs; Wahengbam Birchandra, Metro. Secretary Finance of DESAM graced the book release event. Imphal, Dec 9: As part of the undergoing protest by different political parties in the state, sit-in-protest by Heirok Block Congress Committee also carried out today demanding to disclose the content of framework agreement. The sit-in was carried out at Umang Laikon Community Hall of Heirok Part 1. Former Chief Minister of Manipur, Okram Ibobi Singh, Former Ministers of the party and members took part in the sit-in. Public meeting also carried out during the protest.